Looking for some easy recipes to go along with your relaxing Labor Day weekend? Enjoy these classic late-summer favorites that are perfect for the grill, and savor every moment of your gloriously long weekend. These grilled veggies prove that barbecues aren’t just for meat lovers. Take them to a whole new level by adding some chipotle seasoning. You haven’t had a burger until you’ve tried one of Rachel Ray’s The Book of Burger recipes. Not a fan of bbq sauce? Don’t sweat it—you can swap it out for salsa or horseradish. Whether you choose canned or fresh tomatoes from your local farmer’s market, this zesty recipe will please your taste buds. If you’re looking to really spice things up, you can substitute your serrano peppers for jalapeños. Have a bigger crowd than you expected for your cookout? This is the perfect recipe to feed even the hungriest crowd. For a healthy alternative, swap in multi-grain pasta. With only three ingredients, it’s safe to say that this recipe is pretty much foolproof. But if you’re feeling adventurous, you can season it with a little cayenne pepper and some lime. This is a refreshing new take on a classic. To sweeten it up a bit, add some sour mix or simple syrup. Get fit. Find nutrition facts. Live a healthy lifestyle. Sign up for our newsletter! 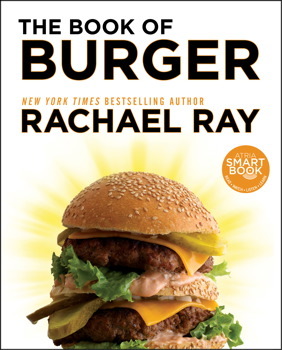 Rachael Ray, #1 New York Times bestselling author and media mogul, offers up the ultimate burger book. The Book of Burger is filled with over 300 recipes for burgers, sliders, sides, sloppies, hot dogs, sandwiches, sauces, toppings and more.